Wordfence offer real-time security against WordPress website attacks. The list of features is pretty impressive, even for their free offering and seems like a no-brainer for someone managing their own WordPress website. Fortunately, Modern Retail clients already have advanced security built into every WordPress website, along with real-time intrusion detection monitoring from AlertLogic. These services make Wordfence redundant in our particular environment. Nevertheless, we're evaluating Wordfence because let's face it a little redundancy is good when it comes to security. 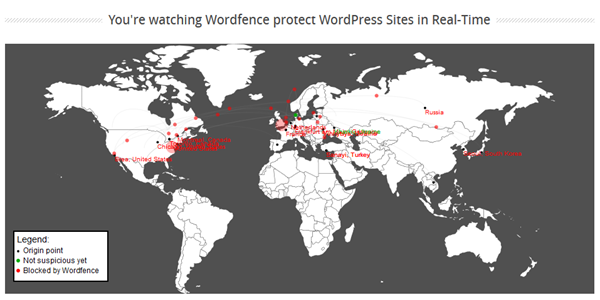 I encourage you to visit Wordfence to check out their real-time world map showing on-going attacks against WordPress. I think you'll find it both horrifying and mesmerizing!